Ahead of 2017's MTV Video Music Awards we relive some of the most memorable moments from throughout the years, counting down to reveal the most shocking VMAs moment ever. 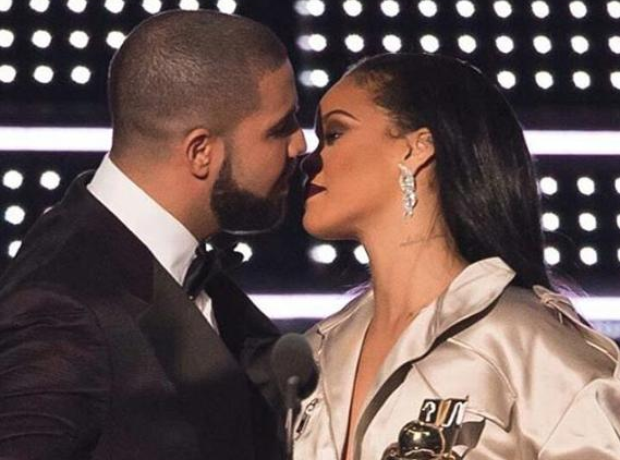 "She's someone I've been in love with since I was 22 years old" Drizzy confessed, before presenting RiRi with her Video Vanguard Award. The pair then appeared to share a kiss on stage - or did she swerve him? The rumoured ex-couple are yet to confirm what REALLY happened. Did anyone catch the moment that a man ran on to the stage during 'Ye and Hov's performance of 'Otis' in 2011? Thankfully for Kanye and Jay (or for the man, depending on Kanye's mood) he was removed by security quickly. Same person, same year. Eminem chose the 2002 VMAs to call out Moby after the singer had beefed him for what he thought was misogynist lyrics. Whilst accepting an award Eminem said Moby was a 'Little Girl' and threatened to 'hit a man with glasses' - apparently Moby thought it was a joke until he saw Eminem backstage. Whilst on stage in front of thousands at the 1999 VMAs Diana Ross randomly starting touching a near-naked Lil' Kim in a very inappropriate place. Why was Lil' Kim even wearing that outfit? It's the VMAs! 11. When Lady Gaga went to the VMA's wearing tomorrow night's dinner (2010). Why did she do it? Who knows, it's Lady Gaga, maybe it's art? All we know is that Lady Gaga turned up to the 2010 VMA's wearing a dress, shoes and headpiece made of meat and no one could stop talking about it. The performance was wild, Miley Cyrus ferociously twerking against a striped-up Robin Thicke for all the world to see. Almost as shocking as the performance itself was just how long people were talking about it afterwards... It felt like it was trending on Twitter for months didn't it? At the end of her performance of 'Love On Top' in 2011, Beyoncé popped open and rubbed her belly to reveal that her and Jay Z's first child was on the way. The moment because the most tweeted event ever - and Jay Z and Kanye West's reaction from the sidelines pretty much summed up the atmosphere inside the ceremony. Beyoncé had one of the best videos of all-time! It's an obvious choice, but the moment that Kanye West stormed the stage to tell Taylor Swift that Beyoncé deserved to win the 'Best Female Video Award' over her, really was one of the best VMA moment - and one of the best Kanye moments - of all time.